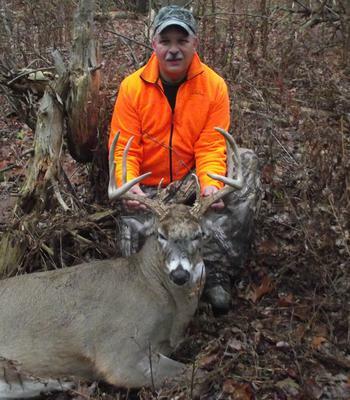 This buck was taken in the town of Avoca on opening day 2017, first thing in the morning. Actually heard him chasing doe in the dark for a good 10 minutes. As the sun came up he was still chasing and grunting but i couldn't see him in the hemlocks up above me. Finally the doe came rushing down the hill one after another. As each doe bounded by me, I searched its head for antlers, seeing nothing. As the last in line came down the hill, 50 yards behind the last doe, I saw the rack and he was pursuing those doe quickly with big bounds. As he got even with me I let out a vocal grunt. At 40 yards he literally came to a sliding stop. I put crosshairs of the .270 just behind his shoulder and squeezed. With the crack of the rifle he took off on angle back up the hill. The last I saw him he was heading down the hill, through some cover before he disappeared and then I heard the crash of him going down. After waiting a bit, I climbed down and walked down to find him. When I saw him, I knew the wife wouldn't be happy as the 8 point I had taken with the crossbow a week earlier, from the same stand was already at the taxidermist. Knew this one was going to surpass his score of 122 and change.